For the Best Raspberry Smoothie Recipe follow these directions using frozen raspberries and strawberries, yogurt and cold milk and you can enjoy the taste of summer goodness any time of the year! (If you prefer, you can use all raspberries instead of both types of berries). If you do not have frozen berries on hand, you can freeze them (on wax paper on a cookie baking tray in the freezer for about 1 hour), or use fresh berries, and add ice cubes to the smoothie recipe, and increase the amount of fruit slightly. 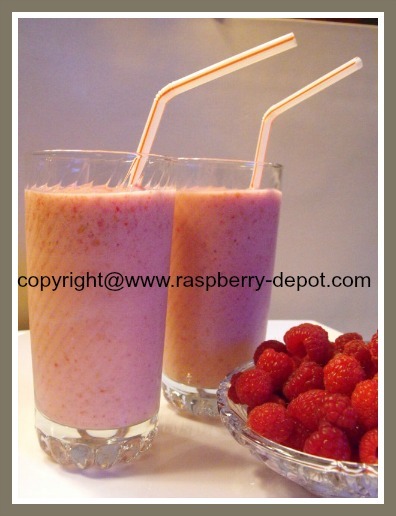 In blender or food processor, puree together milk, frozen fruit and sugar until smooth. To add a chocolate flavour to your Smoothie, use chocolate milk instead of white milk. Chocolate milk is just as nutritious as white milk, providing energy plus 15 essential nutrients. Chocolate milk contains no more sugar than an equal amount of unsweetened orange juice. Interested in good-to-know tips for making the best smoothies?